Canada consists of ten provinces and three territories and is the world�s second-largest country by area after Russia. It is a federal state, a parliamentary democracy and a constitutional monarchy. Canada is one of the world�s wealthiest nations, with a nominal GDP of $1.82 trillion and a per capita income of $ 42,317. It has abundant natural resources, including oil and natural gas, zinc, uranium, copper, gold and iron ore. Canada has the world�s third-largest oil reserves after Venezuela and Saudi Arabia and is the largest producer of zinc and uranium. It is one of the world�s largest suppliers of agricultural products. Canada occupies the sixth rank in the United Nations global Human Development Index. The indigenous people or aborigines have inhabited Canada for thousands of years. European exploration and settlement in the region began in the late 15th century. European colonial powers, especially France and Britain, vied with each other to gain control over the region�s territories and to exploit its rich resources. In the late 15th century, Canada�s aboriginal population was between 500,000 and two million. Nearly 50 per cent of the population was decimated as a result of the outbreak of infectious diseases introduced by European settlers, against which the native people had no immunity. The Canadian federation was established through the British North America Act of 1867, whereby various colonies with their distinctive nationalities and identities were brought together. In 1931 Canada became a sovereign nation under the British crown. Canada is sparsely populated. The population, more than 35 million, is ethnically diverse, consisting of people of European descent, who form the majority, indigenous people or First Nations, Blacks, Chinese and South Asians. Canada has 34 distinct ethnic groups. There are three main cultural streams in the country: English-speaking Canadians (73 per cent), French-speaking Canadians (23.6 per cent), and aborigines (less than 2 per cent). Nearly 85 per cent of French-speaking Canadians live in Quebec, where French is the official language. There are substantial Francophone populations in Ontario, Alberta and Manitoba. The largest ethnic minorities in Canada are Chinese (4.3 per cent), South Asians (4 per cent) and Blacks (2.5 per cent). Canada�s diversity is reflected in its languages. English and French are the country�s main languages, which also have the status of official languages. Official bilingualism is recognized in the 1982 Canadian Charter of Rights and Freedoms and the 1969 Official Languages Act. There are 11 aboriginal language groups comprising more than 65 distinct dialects. Canada has one of the highest per capita immigration rates in the world. About 20 per cent Canadians are foreign-born and more than 40 per cent of them are first or second-generation immigrants. Canada has taken twice as many legal immigrants as the US. In the 1960s a relaxed immigration policy spurred the immigration of hundreds of thousands of Chinese, Indians and Filipinos. In contrast with most European nations, Canada welcomes immigrants with open arms. Nearly 60 per cent of new immigrants have come from Asia, especially China, Philippines and India. Canada welcomes some 250,000 new immigrants each year. Canada has always had an accommodative political culture in respect of immigrants and asylum seekers. Nearly 10 per cent of the world�s refugees are in Canada. The procedure for acquiring Canadian citizenship is far easier than in European countries and the US. While the federal policy favours the professionally qualified immigrants, provinces like Manitoba also take semi-skilled immigrants like truck drivers. Immigrants are allowed to bring their families. Canada was the first country to adopt multiculturalism as an official policy in 1971. The country�s multicultural policies are constitutionally protected through the Canadian Multiculturalism Act of 1988 and the 1982 Canadian Charter of Rights and Freedoms. Multiculturalism was adopted as Canada�s official policy during the premiership of Pierre Elliot Trudeau in the context of the country�s long-established ethnic and cultural diversity, large-scale immigration and Canada�s commitment to liberal democracy. Canada�s multiculturalism emphasizes equality irrespective of the distinctions of race, class or creed, recognizes the country�s diverse cultural heritage and seeks to ensure its protection, safeguards the rights of aborigines and minority groups, and accepts both English and French as official languages. The Canadian Charter of Rights and Freedoms recognizes the collective rights and identities of specific ethnic groups as part of citizenship. In January 2007, Canada�s prime minister Stephen Harper appointed Jason Kenney to the post of Secretary of State for Multiculturalism and Canadian Identity. Canada defines itself through the metaphor of a cultural mosaic rather than a melting pot. It does not have a single or monolithic national identity but a composite, hybridic one. Canada�s national identity has been significantly conditioned by the country�s conspicuous ethnic and cultural diversity, the often problematic and contested relations between the Anglophone and Francophone sections of the population, and the context of immigration and multiculturalism. Canada�s national identity has undergone a process of evolution and reconstruction or reinvention over the past few decades. Until the 1940s, the country defined itself primarily in terms of its English and French identities. Ethnic minorities, including First Nations, Jews, Blacks, Chinese, Japanese, Ukrainians and Germans faced considerable discrimination and marginalization. From the 1960s the Canadian government began to move in the direction of equality and inclusiveness. Quebec, one of the ten provinces of Canada, has nurtured a distinctive and deeply-entrenched identity of its own. This shared identity has been buttressed by the predominance of the French language and culture, Catholicism, shared territory and a separate historical tradition. In the 1960s Quebec began to witness the stirrings of an ethnonationalist movement, which was spurred by a growing feeling among Quebeckers that they were being treated as second-class citizens by the Anglophone-dominated federal government. They argued that they faced discrimination and marginalization in education, language and employment. The Canadian government tried to deal with the issue through negotiations in a spirit of accommodation. Lester Pearson, the then prime minister (1963-68), set up a Royal Commission on Bilingualism and Biculturalism, with a view to strengthen the Canadian federation based on an equal partnership between the Anglophone and Francophone communities. Pearson acknowledged that though Quebec was a province in the Canadian federation, it represented much more than a province in that it was the heart of a people and is in fact a nation within a nation. Pearson�s views and policies were set aside by his successor, Pierre Elliot Trudeau (1968-79 and 1980-84). Trudeau, who was of mixed British-French extraction, denounced Quebec nationalism and described it as dangerous to democracy and human rights. He emphasized a strong, pan-Canadian identity in the framework of federalism, transcending all sub-national, including Quebec, identities. He repudiated the notion of a binational and bicultural Canada. However, Trudeau�s view proved to be self-defeating in that it fuelled and revitalized Quebec nationalism and separatism. The growing mistrust and estrangement between the federal government and Quebec resulted in the holding of two referendums on the province�s secession from the Canadian federation in 1980 and 1995. In the 1995 referendum, spearheaded by Parti Quebecois, 49.4 per cent of Quebecois voted in favour of Quebec�s independence while 50.5 per cent voted against it. In recent years, the pro-independence movement has lost much of its strength. The pro-independence Parti Quebecois was defeated in the 2003 provincial elections, but won a minority mandate in the 2012 general election. The extremely narrow margin by which the vote on Quebec�s separation from the Canadian federation was defeated in the 1995 referendum betrayed the fragility of the relations between the Anglophone and Francophone sections of the population. The discontent in Quebec continues to simmer. The Quebecois are not enthusiastic about the prospects of a multicultural state because, in their view, it tends to undermine their contribution and role in the making of the nation. They assert that the Canadian federation is the outcome of two founding fathers, the Anglophone and Francophone sections of the population, and that Canada is a binational country with a dual identity. In late 2006, the Canadian parliament endorsed that Quebec should be considered a nation within a united Canada. The presence of Muslims in Canada goes back to the 1870s. 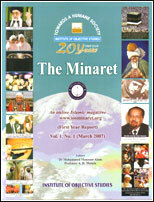 The first mosque in the country was constructed in Edmonton in 1938. There are now 55 mosques in Canada. According to the 2011 National Household Survey, Canada�s Muslim population has crossed a million, making up about 3.2% of the population. Most of them are concentrated in Ontario (581,000), Quebec (243,000) and Alberta (113,000). 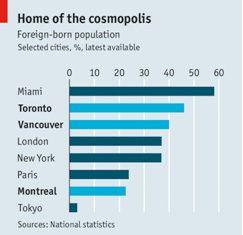 There is a sizeable Muslim population in Vancouver, Calgary, Edmonton and Windsor. The majority of Canadian Muslims are migrants from Lebanon, Iran, Bosnia-Herzegovina, Somalia, Algeria, Pakistan, Bangladesh, Yemen, Albania and Turkey. Canadian Muslims are visible in public life, including politics, education, police, civil society and the media. A Muslim woman, Fatimah Houda-Pepin, was elected to the Quebec National Assembly in 1994. 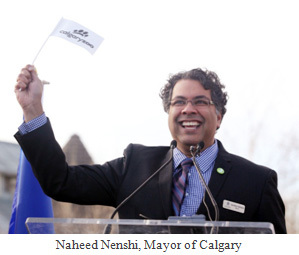 Naheed Nenshi, a 38-year-old Harvard-educated Ismaili Muslim became the mayor of Calgary on October 18, 2010. He braved a smear campaign launched by his opponents and defeated two candidates, Ric McIver, supported by the Canadian Prime Minister, Stephen Harper, and Barb Higgins. Lakeridge Health, one of the leading hospitals in the Greater Toronto Area, ran an advertisement in the media, inviting health professionals to join. 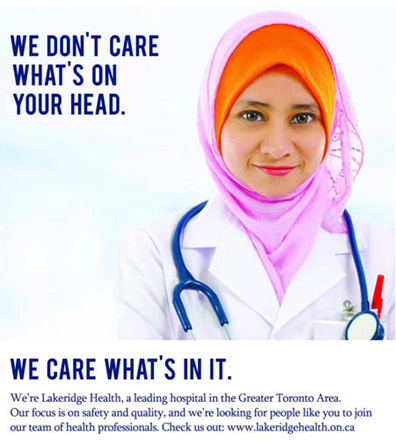 The ad carries the picture of a Muslim woman wearing a hijab and a stethoscope, with the caption, �We don�t care what�s on your head. We care what�s in it.� Following the advertisement, applications doubled. Ever since the creation of the Canadian federation in 1867, Quebec has assiduously safeguarded its distinctive identity, which is rooted in the predominance of the French language and culture and Catholicism. A large majority of Quebec�s population (over 83%) consists of French-speaking Catholics. For the past several decades, the relations between Quebec and the Anglophone Canadians have been characterized by an uneasy coexistence and accommodation. There are fundamental, irreconcilable differences between the mindset and ideology of Quebeckers and those of Anglophone Canadians. While the large majority of Anglophone Canadians believe in the recognition and accommodation of cultural diversity, which lies at the heart of multiculturalism, Quebeckers espouse monoculturalism, cultural homogeneity and the assimilation of immigrants and foreigners into the mainstream Francophone society. They look up to France as a role model and believe that their core values have much more in common with French society than with Anglophone Canadians. Quebeckers have serious misgivings about multiculturalism. In September 2013, Quebec�s premier Pauline Marois, a leader of Parti Quebecois which has campaigned for Quebec�s separation and independence since the 1980s, blamed multiculturalism for violence and bomb attacks in England and added that France�s secularism was preferable to Britain�s multiculturalism. There has been a strong undercurrent of resentment and hostility against Muslim immigrants and asylum seekers in Quebec. This is particularly reflected in Quebec�s policy towards the Islamic headscarf. Since Canada follows the federal system of government, provinces have the freedom to enact their own laws. Quebec has banned the wearing of face-covering veils or niqab in schools and hospitals and in sports. 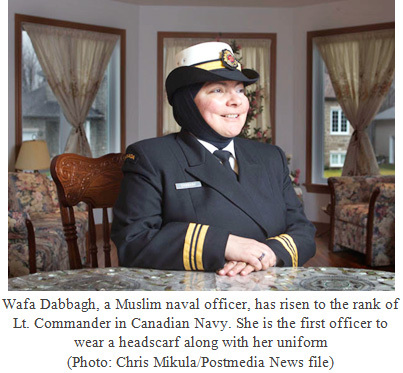 Pauline Marois has said that hijab is a �form of submission,� adding that �a veiled educator�. has authority over children and could incite them to practice her religion.� Quebec�s soccer association has banned the wearing of headscarves and turbans in football matches. 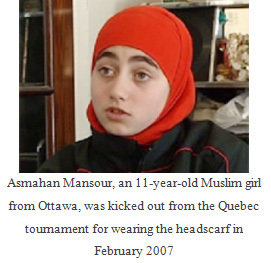 In February 2007, Asmahan Mansour, an 11-year-old Canadian Muslim girl was kicked out of the Quebecois tournament because she refused to take off her headscarf. Interestingly, the Canadian Soccer Association and the Ontario Soccer Association allow the wearing of headscarves and turbans on the pitch. Similarly, the Greater Montreal Athletic Association allows Muslim players to wear sweat pants instead of shorts. Quebec�s governing Parti Quebecois has introduced a bill, called the Quebec Charter of Values, in the National Assembly in November 2013. The Charter prohibits state employees at offices, schools, hospitals, courts, police stations and daycare institutions to wear any religious symbols, including the Islamic hijab, Sikh turbans, Jewish kippas and visible crucifixes. The bill has aroused an intense debate in Quebec as well as in other parts of Canada and has been condemned it for its divisive and polarizing implications and consequences. There have been widespread protests against the bill from minority groups, especially the Muslim community. Charles Taylor, a renowned Canadian political philosopher, has described the charter as an �absolutely terrible act of exclusion.� The introduction of the bill has led to a heightening of Islamophobic sentiments across the province. Veiled Muslim women have been increasingly subjected to insults and slanderous remarks. A mosque in Chicoutimi was sprayed with pig blood. 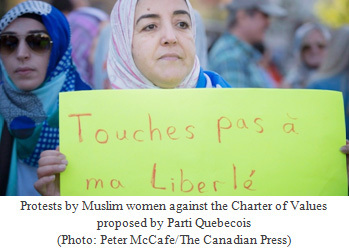 Parti Quebecois has sought to justify the Quebec Charter of Values in the name of secularism. Evidently, the inspiration for the charter has come from France, which has banned the wearing of the Islamic headscarf as well as other religious symbols in public institutions. It is instructive to have a close look at the practice of secularism in France and in Quebec, which is fraught with contradictions. Laicite or secularism is the cornerstone of the French republic. Roughly speaking, the term secularism denotes the separation of church and state. Laicite is regarded as not just any secularism, but a special and distinctive French version, at once more universal than any other and unique to French ethos, traditions and national character. Laicite is part of the mythology of the specialness and superiority of French republicanism. During the past two centuries, France has tenaciously held on to the idea of a nation single and indivisible. French universalism insists that sameness is the basis for equality, and this sameness is achieved not simply by swearing allegiance to the nation but by assimilation into the norms of the national culture. A glimpse into the historical and cultural context of laicite is sufficient to expose the mythological superiority of the doctrine. Historically, France has worked out an accommodation with the Catholic Church in many ways. Even after the separation of church and state was mandated by law in 1905, public schools accommodated the desire of parents (and the pressure of churches) for children to have religious instruction and treated it as a right. The avowedly secular state also maintains religious buildings, mostly Catholic, as a public responsibility. Since 1958, the French government has contributed 10 per cent of the budgets of private Christian schools. More than 2 million children attend state-supported Catholic schools. The school calendar still observes only Catholic and state holidays. In some areas even more dramatic compromises with religion have been worked out. The three departments of Alsace-Moselle, lost at the end of the Franco-Prussian War in 1871 and regained after World War I, have never been required to conform to the terms of the 1905 pact. In Alsace-Moselle, religious instruction (for Catholics, Lutherans, Calvinists and Jews) is still a mandatory part of the curriculum in public schools. With the permission of their parents, children who do not want to take these classes may substitute courses in morality. The contradictions that betray the yawning gap between the ideal of secularism and its application in France can be seen in Quebec as well. The Quebec government subsidizes semi-private Catholic schools. 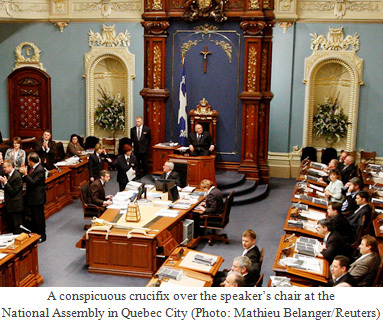 There is a conspicuous crucifix over the speaker�s chair in Quebec�s National Assembly. The defining feature of multiculturalism is the recognition of cultural diversity and the accommodation of the religious and cultural sensibilities and identities of minority groups in a framework of equality, tolerance, inclusion and engagement. Laws and policies that seek to homogenize society and disregard the sensibilities and identities of minority groups are likely to be counterproductive and self-defeating in the long run. They will force minority groups to disengage from mainstream society and to seek refuge in ghettoized enclaves. Furthermore, they are likely to provide a breeding ground for extremism and radicalization. A vivid example of the failure of monoculturalism and forced cultural homogeneity is provided by France, where Muslim citizens (who are mainly of North African origin and make up about 10% of the country�s population) are plagued by a deep sense of alienation and social, economic and political marginalization. Some Western countries, which have sizeable minority groups, have taken a commendable initiative to accommodate the religious and cultural sensibilities of minority groups. 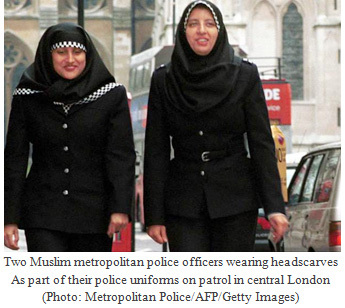 In 2001 London became the first city in Britain to allow female Muslim police officers to wear the Islamic headscarf as part of the official uniform. 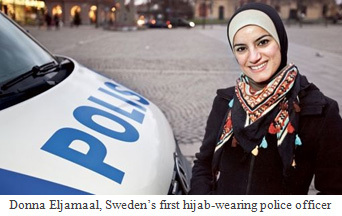 Sweden allows female Muslim police officers to wear the headscarf as part of their regular uniform. 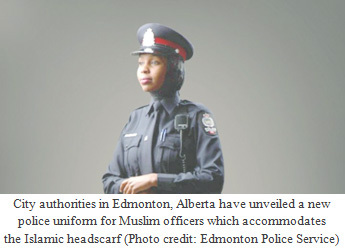 The wearing of the Jewish kippa and the Sikh turban are also permitted for police officers. 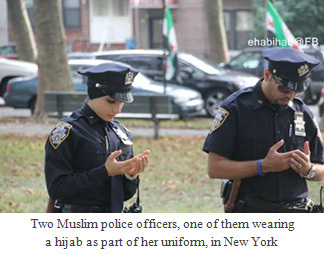 In the United States, female police officers are allowed to wear the headscarf as part of the regular uniform. In January 2014, the US military eased rules relating to the uniform to allow the wearing of religious symbols, including beards, skullcaps and turbans. Football or soccer is the world�s most popular game, played by over 250 million people in 200 countries. Though it is largely male-dominated, a fairly large number of women and girls around the world enthusiastically play the game. According to the International Federation for World Soccer (FIFA), the world football governing body, more than 29 million women and girls�and their numbers are constantly growing--play the game. In 2007 FIFA banned women wearing headscarves from playing football for safety reasons and because of rules that stipulate that religious or political symbols should not be allowed on pitch. The Iranian women�s football team had to forfeit a match against Jordan in June 2011 because they refused to remove their headscarf. The ban on the wearing of headscarves on the pitch has been contested by many Muslim and non-Muslim athletes, who have argued that the ban promotes inequality in the world�s most popular game and inhibits the potential for it in Muslim countries. The United Nations joined the calls for lifting the ban. In 2011, a group led by FIFA�s vice-president, Prince Ali Bin al-Hussein of Jordan, successfully convinced the International Football Association Board (IFAB), of which FIFA is a major member, that the hijab was a cultural rather than a religious symbol and therefore the ban on it on pitch was unjustifiable. In July 2012 lifted the ban on the wearing of headscarves on the pitch. The growing worldwide salience of ethnic and cultural consciousness, the great migrations of the post-World War II period and the increasing visibility of transnational diasporas provided the social and cultural context of multiculturalism. The revival and reawakening of ethnic consciousness and identities among immigrants has been strengthened by the rapid, unprecedented advances in transportation and communication technologies. Broadly, transnationalism refers to multiple ties, interactions and networks that link large numbers of people across the borders of nation-states. Such networks are greatly strengthened by the incredible advances in transportation and communication technologies. Intensity and simultaneity are the most striking features of transnationalism. Transnational diasporas represent the most important aspect of transnationalism. The diaspora is characterized by a triadic relationship between a globally dispersed yet identity-conscious ethnic group, the countries where such groups are located, and the original homeland. Transnational diasporas represent important modes of social organization, communication, and political and cultural mobilization. They play an important role in reinforcing and transmitting shared ethnic identities. Germany�s Chancellor Angela Merkel told a meeting of young members of her ruling Christian Democratic Party on October 16, 2010 that Germany�s attempt to build a multicultural society had turned out to be an utter failure. She said it had been an illusion to think that Germans and foreign workers could �live happily side by side�. �We kidded ourselves for a while that they wouldn�t stay, but that�s not the reality,� she said. However, she stressed in the same speech that immigrants were welcome in Germany and that Islam was a part of the nation�s modern-day culture. An alternative to multiculturalism � multicommunitarianism -- has been proposed by the present author. The idea, which has been conceptualized in the context of present-day multiethnic societies, emphasizes the overriding importance of societal cohesion and harmony amid ethnic and cultural diversity. Essentially, multicommunitarianism connotes living together in a framework of equality, an open recognition of cultural diversity, respect for the rights and sensibilities of others, sharing of social, cultural and civic spaces, and societal engagement. The idea is offered as an alternative to individualism, communitarianism, monoculturalism and assimilationism, ethnic nationalism and multiculturalism. It may be pointed out that while multiculturalism, which is premised on the celebration of diversity, suffers from a deficit of societal cohesion and harmony, the assimilationist model is bedeviled by a democratic, liberal deficit. 1. Montserrat Guibernau and John Rex. eds. The Ethnicity Reader: Nationalism, Multiculturalism and Migration. Cambridge: Polity Press, 1997. 2. Charles Taylor. Multiculturalism and the Politics of Recognition. Princeton, New Jersey: Princeton University Press, 1992. 3. Will Kymlicka. Multicultural Citizenship: A Liberal Theory of Minority Rights. Oxford: Oxford University Press, 1995; Anthony Giddens. The Third Way. Cambridge: Polity Press, 1998, p. 136.